The world's largest credit card transaction processing company, PayPal, is our credit card processor. All credit cards are accepted or you may use your PayPal Account. Posting a payment is secure, quick convenient and easy! 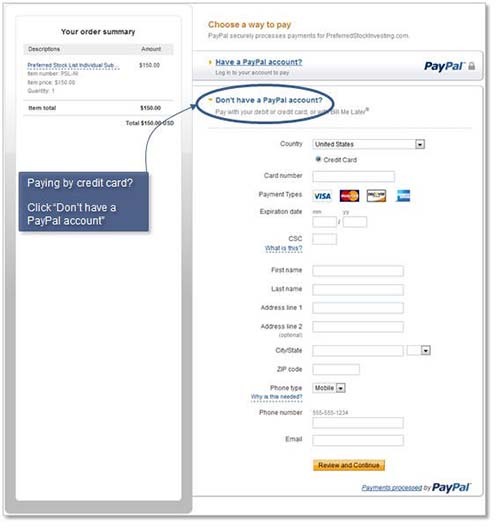 You do not have to create a "PayPal Account" to pay by credit card. Just click on the words "Don't have a PayPal account" and a panel will open where you enter your credit card information (shown here). That's all there is to it. If you have a PayPal Account and want to use it to subscribe, just click on the "Have a PayPal account" link and sign into your PayPal Account. You will receive an immediate auto-reply email message (check your spam folder if you do not receive the auto-reply within a few minutes).